Despite their similar appearance, Miniature Pinschers are not mini versions of the Doberman Pinscher. In fact, Miniature Pinschers preceded the existence of their larger lookalikes by about 100 years. They were bred in Germany from a mixture of the Dachshund, Italian Greyhound and German Pinscher, though they’re also believed to have Terrier blood, which makes them natural born burrowers. Their small stature means they are defined as ‘Toy dogs’, but don’t be fooled – these little pooches are tough and fearless. Their majestic grace and pristine looks have earned the breed the nickname ‘the King of Toys’. Playful and prancy, Min Pins need a lot of exercise and attention, though their size means they can be suitable to apartment living. They are trainable, but need patience and understanding during training. If socialised at an early age, they will get along with everyone, including small children and other dogs. 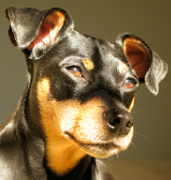 Min Pins are generally robust dogs and only have a couple of health concerns. Their bones are small and brittle, and so care must be taken to protect them from breakages. They are also prone to overeating. Join this group to club together with other Miniature Pinscher owners to get a great deal for you feisty little royal.